London, Hong Hong, Florida, Gothenberg, Brisbane, Singapore, Mexico City, London, Denmark, Florida, Massachusetts, Kuwait, London, Qatar, Dublin, Kuala Lumpar, Belfast, London, Denmark, Stormont, Amsterdam and the Faroe Islands. In between all this, the National Clinical Director for NHS Scotland has presented at TEDx 2017 and hosted TEDx 2018. 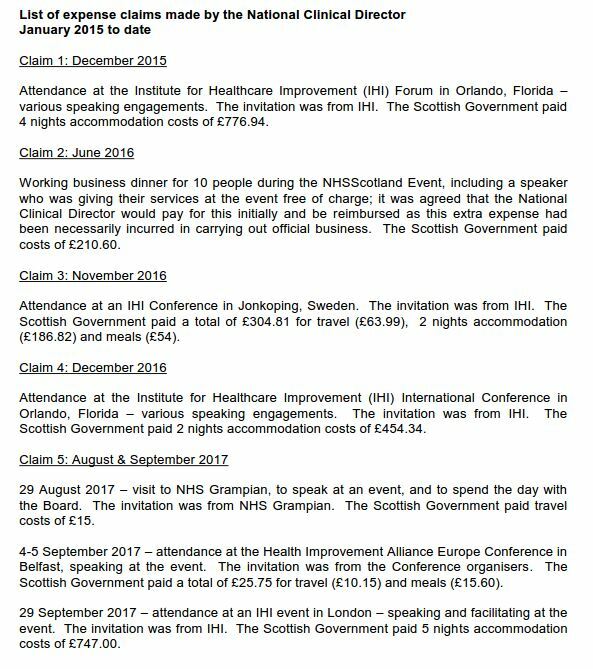 The following is a list of some of the events that the National Clinical Director for NHS Scotland has attended. April 2015, London IHI Forum, Joint chair of seminar panel. August 2017, Kuala Lumpar, IHI Conference, Speaker. Below: FOI response from the Scottish Government dated 11 December 2017 (the initial FOI request was refused by the Scottish Government) and this information was only received after challenging the Scottish Government's interpretation of FOI legislation.